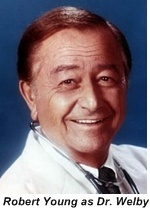 Dr. Marcus Welby (Robert Young)was a family practitioner with a kind bedside manner. 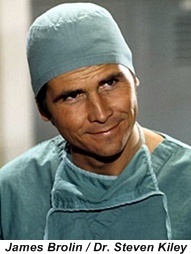 It was this kindness and his thoroughness that involved him in his patients lives including their work and family life. Unlike the then trend for specialization in medicine Marcus Welby believed in treating the whole individual not just the symptoms. He takes on a young partner in Dr. Steven Kiley (James Brolin) who takes a break from his neurology training to try out private practice. As far as we the audience know he never goes back to those studies. Being fresh out of Medical School Dr. Kiley takes a more text book approach to cases and hasn’t yet mastered any sort of bedside manner. 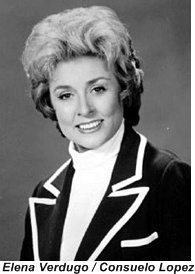 This difference in styles leads to the inevitable conflict between the characters which is often softened by their nurse/receptionist Consuelo Lopez (Elena Verdugo). The twist in this show is that the older Welby is the one who proposes the more unorthodox treatments while the far younger Kiley is the conservative one. In most cases however the kind and knowing Welby usually has the correct approach, proving his young partner wrong in the end. Welby is a widower who we find out in the last season has a married daughter and a 6 year old grandson. There is never a mention of a wife however. And one more important fact, this may come as a complete shock to some younger visitors to this site but Dr Welby made house calls. 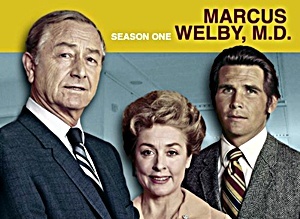 Video Clip of Marcus Welby M.D. For exterior shots of Dr. Welby’s home / office the exterior of the house that was used for Leave It to Beaver was reused. The only difference was Dr. Welby’s shingle.